Knitting…it’s not just for wearing. 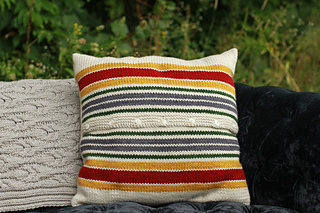 Sometimes we can use knitting to dress up our home. 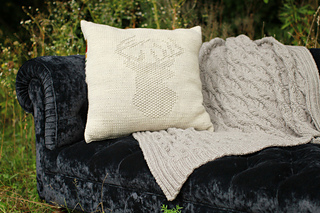 And, if there is one thing that says Plucky, it might just be a stag sporting a beautiful set of antlers, propped up in a favorite chair. 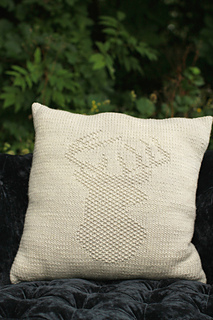 This is an oversized pillow, with a noble stag’s head motif on the front and a rich blanket stripe on the reverse. Mix those colors! • Plucky Knitter Cambridge: Twill (MC) 4 skeins, Park Service, (CC1), Utility (CC2), Corn Maize (CC3) and Only You (CC4) 1 skein each. • Optional - fiber fill to tuck inside the corners of the finished pillow to plump up the corners.